I am in Rwanda; Africa after having completed an intensive retreat called Bearing Witness Rwanda. The purpose of the Retreat was to bear witness to the 1994 Genocide that occurred here and its aftermath. In short, over 800, 000 people were brutally killed because of their ethnic background and a conspiracy by other nations who knew what was about to happen and turned the other way. This genocide has left Rwanda in many ways devastated. Of course, after 16 years the country is rebuilding itself; yet many resources are not present. 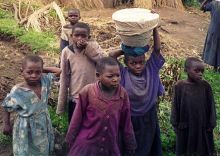 70% of Rwanda is comprised of youth with the average age being 17 years old. As a result of the genocide, many children are orphaned or living on the streets. Many people are still in a state of post traumatic stress or face trauma related issues. The unique and interesting thing about Rwanda is that the memory of the genocide is still fresh. There are many mass graves and memorials, some of which still have bones exposed and decomposing. There are many survivors who have stories fresh in their minds. Some are willing to talk and some are still not yet ready. There are also stories of heroes/sheros who risked their lives to save others. And, in the midst of all of this; Rwanda is absolutely beautiful. Rwanda actually means land of one thousand hills. The people we have met have been generous, kind, and unbelievably resilient. Why am I interested in sharing with you about Rwanda? I believe that Rwanda offers many opportunities and lessons for humanity such as the capacity of humane beings to be profoundly evil and/or profoundly good. Also, an opportunity to be conscious of our freedom to choose in any given situation. During my time here, I have hugged survivors and shook hands with killers. I have stood face to face with thousands of skulls, bones, and clothing worn by those who perished. I have comforted young adults as they visited the memorial sites which held the remains of their loved ones in mass graves. I have cried. I have laughed. I have prayed and been in deep silence. I have asked myself: What is the work of my hand? Why have I come here? How do I commit little genocides each day through my words, thoughts, or actions? While here in Rwanda, I have been the died; I have survived; I have been the killer. I have been the rescuer. American; African; and the world that closed its eyes and pretended nothing was happening and nothing happened. Not knowing involves suspending judgments and the ways we think things should be. Bearing Witness involves being with everything just as it is and is not; being present. Loving action for me involves looking at what ways I can consciously act and be differently given all I have witnessed. As I continue to be with and process my experience, I continue to be in the spaces of not knowing, bearing witness, and loving action. So, I guess I am having a personal retreat after the retreat. I guess it is no accident that the entire Retreat group is still here in Rwanda because of the Iceland volcano eruption.